At our welcome meeting on day 1 I had been pleasantly surprised to learn that our tour leader, JP, had a growing interest and a great eye for photography. He mentioned getting up early the next morning to do a morning wander and photo walk. I was interested, but so tired! I was still adjusting to jet lag. Several of the other travelers were considering it, but no one really wanted to commit to getting up at 5am. In the end, we told JP not to come as none of us could commit. Eventually, he decided he was going regardless and would be at the hotel to see if anyone wanted to join him. Well, I couldn’t stand him up! Myself, Iris and Kiley woke up extra early that morning and joined JP for a walk to an even less touristy district of the city. It wasn’t even that hard to wake up. Afterall, the roosters started crowing sometime between 4:30am and 5am and in that time you’d also hear loud speaker announcements or music throughout the streets as the monks wound their way through town taking offerings. Being low season and an up and coming destination, Yangon wasn’t very touristy to begin with. In the first two days I had seen no more than a dozen tourists (not a word of a lie). We strolled along Strand road for about 15 minutes until we came to a pagoda. We entered through the gates and wandered through a small local market while it was still quite dark. It’s quite amazing how the city wakes up so early and is on the move before the crack of dawn. By 6:00am the sky was starting to get a bit lighter and more people were up and moving around. The market stalls were beginning to open and in the distance, we could see monks beginning to line up for their walk through the streets to collect food and money. We headed toward the monks and after double checking with JP, he assured me that it would be fine to take photos and interact with them. In fact, they didn’t have nearly as many rules and restrictions as I thought. For some reason, I thought that monks were not ever allowed to speak. Is this the way it is in other cultures, or just during certain times? I’m still yet to find that out. But, these monks were allowed to speak and many of them knew English quite well. They were a mixture of shy and curious, confident and awkward. Some of them were happy to have their photo taken, others politely turned away. I tried not to be too intrusive, not getting too close and only photographing them if I had made eye contact or asked their permission. Most of them were happy to have their photo taken, but didn’t freely smile. This is where JP came in extra handy. He had seen all of this a million times, so he was happy to make funny faces and get the monks laughing so that we could get great photos. I chatted a little bit in English with a few of them. Honestly, they are really friendly and often want to practice their English, but I think I was more shy than they were as I felt like somehow I was still being disrespectful by photographing them. After about 20 minutes of wandering around, starring at and taking photos of monks a man came over to JP and invited us in to the monastery for breakfast. Of course we joined them! What a lovely opportunity … the kind that you can’t recreate or find in a guide book, the kind that is local and just happens. Volunteers, or families donate their time regularly to cook food for the monks. This morning, the family was inviting us in to join them. 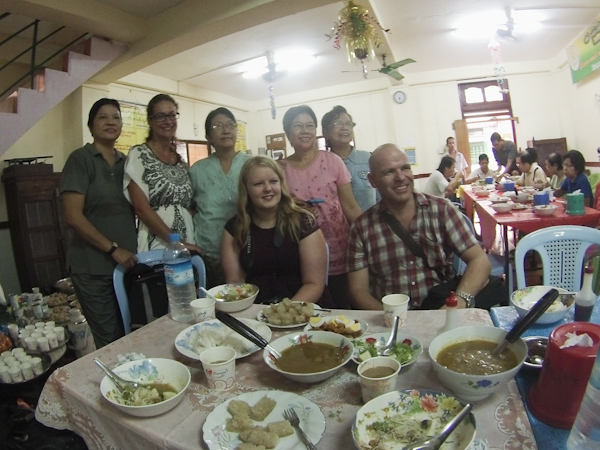 We took off our shoes and headed in through a couple of rooms to a spot where about 40 or so locals were seated and filling their bellies with hot delicious food. And then came the sticky rice. OH sweet sticky rice. I could have eaten an entire plate full of this deliciousness. Sticky and cut into small ½ inch squares, it was sweet and absolutely divine. After we had nearly finished our typical, local breakfast, Iris wanted a photo with a couple of the locals. Moments after that, locals were rushing over to get photos of all of us with them for their own keepsakes with their cameras. Such an interesting turn of events, being on the other end of the lens. What can you do though? You go to another country and take tones of pictures of them, you can’t say no when they want to photograph you because you are equally foreign and beautiful to them! It was really such a special morning when we all really got a feel for the warmth and generosity of the local Myanmar people. We were complete strangers, invading their space and they wanted to give to us, treat us well, feed us and do good deeds. I’ve learned that the Buddist way of life is far beyond the generosity and caring even of a little old East coast – Canadian. Everything they do in Myanmar comes from the heart with a warm smile and no material alterior motive. Simply the motive to do good, be better and eventually reach a state of nirvana where they have done good deeds all of their life. It certainly takes you back to a simplistic thought process and reminds you of what’s important in life. Friends, family, experiences, your happiness, health and well-being … not material items. It reminds you to be kind to others, no matter what your situation and that money doesn’t buy happiness.